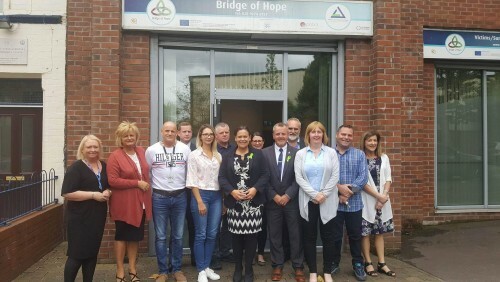 Mary Lou McDonald, Deputy Sinn Féin Party Leader and all-Ireland Spokesperson on Mental Health & Suicide Prevention met with community groups today at the offices of Bridge of Hope, a department of Ashton Community Trust. Monday’s meeting in North Belfast involved TD Mary Lou McDonald and Cork TD Pat Buckley hearing views from community sector representatives working on suicide prevention across the city. Speaking after the meeting, Irene Sherry and Stephen Barr from the Belfast Forum for Suicide Prevention said they were delighted to meet with the Sinn Féin TDs and highlight recent community efforts to reenergize hearts and minds around suicide prevention. Mary Lou McDonald TD added: “It was a very useful and informative meeting. Mental health and suicide know no boundaries of class or political allegiance. As a community, we need to work together and learn from each other and support each other in the work that lies ahead. The challenges are considerable but we have the talent and energy in the community to make a huge difference. Caption: Martina McIlkenny PIPS Charity, Jo Murphy Lighthouse Ireland, Stephen Barr Start 360, Claire Flynn East Belfast Community Development Association, Mary Lou McDonald, Pat Buckley, Irene Sherry Ashton Community Trust, Phil McTaggart Mindskills, Jean Fox Bridge of Hope. Back Row: Ronan McGinley Start 360, Gerard Rice LORAG, Áine Magee Bridge of Hope, Peter McBride NIAMH.